The best tennis shoes for women can be found from any of the major tennis shoe brands. The shoes that will be best for you will depend heavily on your personal preferences. Each brand has its own benefits and drawbacks. When choosing shoes, you should also consider what surface you play on. For hard courts, you will need a shoe with better cushioning; for clay courts, you will need more lateral support and traction. Another major component is your foot shape. If you have a high arch, narrow, or wide feet, you will need shoes with different foot beds and support. Although there are excellent options from any of the major brands, the following three options are the some of the best tennis shoes for women. ASICS has great shoes for both men and women at a variety of price points. One of their best options are the women’s Gel-Solution Slam 2 tennis shoes. They are fairly lightweight while providing support and cushioning. Although these shoes are technically made for all court surfaces, they are best suited for softer courts as they are lightweight. If you do decide to play on hard courts, however, the gel cushioning will protect your feet well. One thing to keep in mind is that they do run a little small, so you will need to size up slightly. Also, since they are lightweight they do not have the rigid support of other tennis shoes. 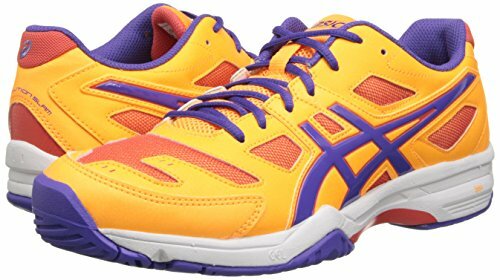 Overall, the ASICS women’s Gel-Solution Slam 2 tennis shoes are an excellent choice for a lightweight tennis shoe. Out of all the options, these are one of the best options for women’s tennis shoes. Nike also makes a wide variety of tennis shoes for both men and women. 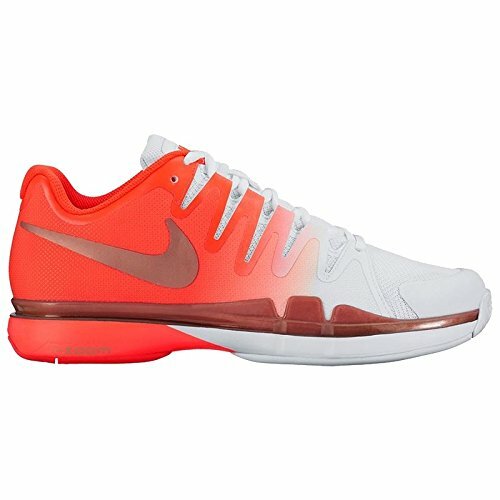 The women’s Zoom Vapor 9.5 Tour tennis shoes are one of their top designs. These shoes are made for all court surface types. The Zoom Vapor 9.5 Tour tennis shoes’ main claim to fame is that they have a customized fit. Because they are totally adjustable, they will fit each player uniquely for a glove-like fit. Unlike the previous option, these shoes work well for both hard and soft courts. They fit high up the ankle, providing good support for lateral moves on a clay court. They also, however, have great cushioning and shock absorption for hard courts. The Nike women’s Zoom Vapor 9.5 Tour tennis shoes are an excellent all-around tennis shoe. No matter what surface you play on, these are one of the top tennis shoe options for women. The Adidas Performance women’s Galaxy Allegra III tennis shoes are one of the top Adidas pairs. Unlike the previous two options, these shoes cater to hard court players mainly. One thing that makes these shoes stand out against the other hard court options is that they are very light weight. While most hard court shoes are heavy in an attempt to be durable, these manage to have the best of both worlds. As with many other options on the market, these shoes can run a little big for narrow feet. Make sure you size down by about half a size to optimize the fit. The Adidas Performance women’s Galaxy Allegra III tennis shoes are a great choice for hard court tennis shoes. Between their supportiveness and comfort, they are one of the best tennis shoe options for women. Each tennis shoe brand offers different features and fits different needs. Consider what your personal needs are before purchasing any tennis shoes. Although there are many other good options, because of their superior features, the three options discussed above are the best tennis shoes for women on the market.